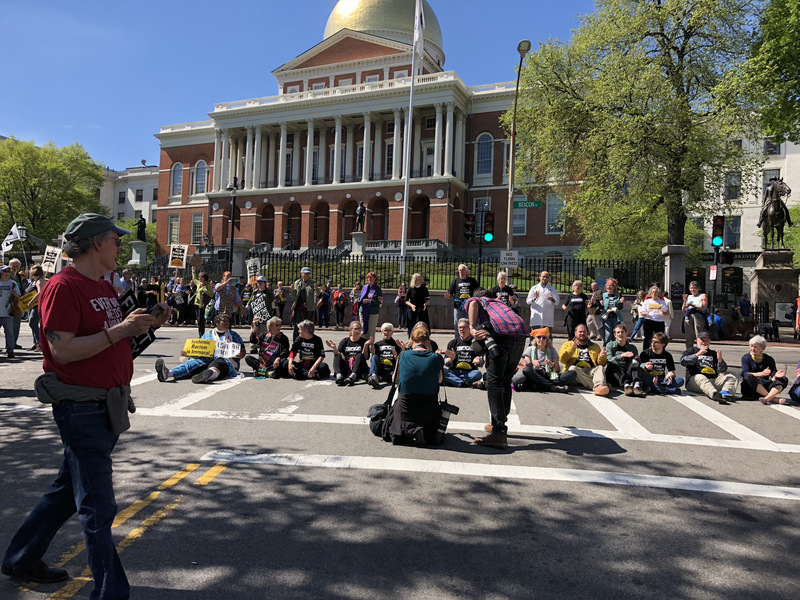 On Monday, many of you joined the more than 400 people who came to the Massachusetts State House for the Poor People’s Campaign: A National Call for Moral Revival. to launch the largest wave of nonviolent in civil disobedience in US history. Twenty-six people trained in nonviolent civil disobedience blocked traffic on Park St. and Beacon St., and risked arrest for over an hour. Instead of arresting us, the Boston Police closed down Park st. and restricted Beacon st. 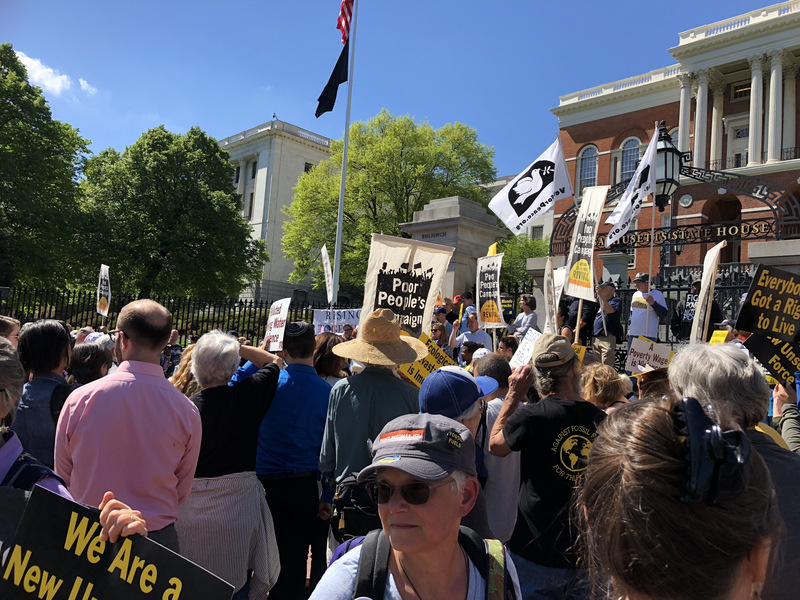 This action kicks off our our six-week season of nonviolent direct action in Massachusetts. For the first week, we focused on child poverty, women in poverty and people with disabilities. Monday’s actions come as the Trump administration pushes work requirements for SNAP recipients and seeks to cut $7 billion from a child healthcare program. Supporters took these incredible photos. See more photos and video on our Facebook page. Get Involved with the Poor People’s Campaign: Join our Volunteer Orientation meeting Saturday, May 19th, 10 am in Quincy! 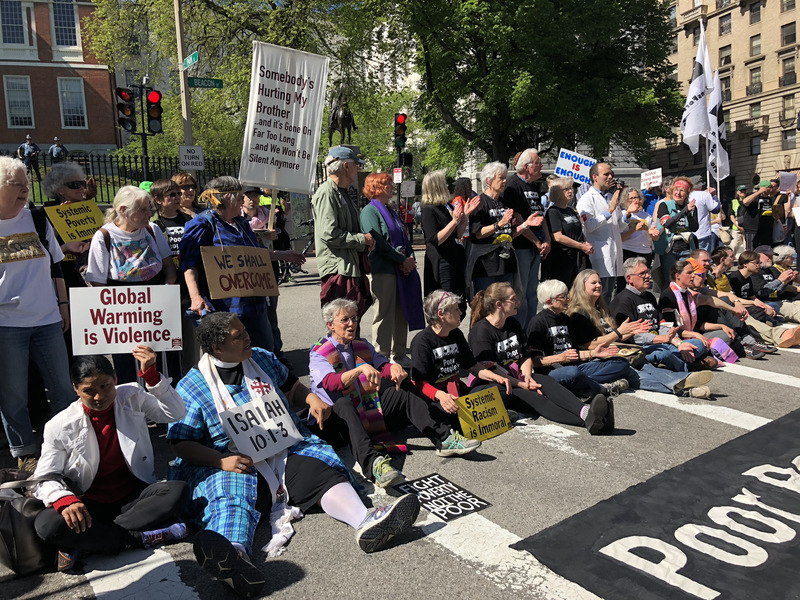 Together North Shore’s Teach-in on the Poor Peoples Campaign, Tuesday, May 22nd in Beverly. Come to our Thursday Justice Jams led by our Theomusicology Team. The Next one is May 24th at Viet Aid, 34 Charles St, Dorchester. Our theme for Week Two (May 21) is Linking Systemic Racism and Poverty: Voting Rights, Immigration, Xenophobia, Islamophobia, and the Mistreatment of Indigenous Communities. Join us on Boston Common at 2pm; RSVP here. This is an important issue for anyone who cares that almost half—23 states—have adopted some form of voter suppression law since 2010; that deportations have increased tenfold between 1976 and 2015; or that Native Americans and Alaska Natives have the highest poverty rate of any racial group. If you RSVP to Week Two’s rally, we’ll send you a reminder email ahead of time and give you instructions on when and where to show up.